I’m a huge fan of doughnuts (I’ll stick to the traditional spelling), they’re terribly bad for you though aren’t they, so they’re certainly not a weekly treat. I like the doughy yeasty ones better than the cakey ones. And whilst I do love to try the various kinds that the likes of Krispy Kreme put out, I always think you can’t beat a good basic jam doughnut. 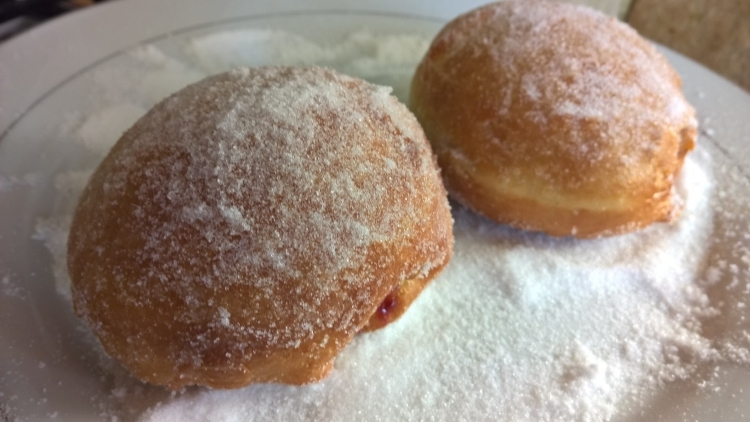 I have to say though, I’m not too keen on the jelly inside the jelly doughnuts I’ve tried when I’ve been in the states, I find it a bit artificial, I prefer a proper jam. 1. Combine the flour, yeast, salt and sugar in a large bowl and mix well. Put the butter into a bowl with the warm milk and water, and stir to melt. Pour this into the mixing bowl, along with the egg, and stir until it comes together into a dough: it should be firm, but soft. (I had to add another heaped tablespoon of flour myself as it was too sticky). 2. Tip on to a lightly floured surface, or into a mixer fitted with a dough hook, and knead until smooth and elastic (about 10 minutes). Put into a lightly greased bowl, cover with a damp tea towel, and leave in a warm place until doubled in size (about an hour). 3. Shape into 6 equally sized balls and place on a lightly floured baking tray or board, spacing them well apart. Cover and leave to rise again in a warm place for 45 minutes. 4. Heat the oil in a large pan or deep-fat fryer to 160C. Cook the doughnuts 2 or 3 at a time, for 3 minutes on each side, until golden, then blot with kitchen paper and sprinkle generously with caster sugar. Allow to cool slightly, then make a small hole in the side of each, and use a piping bag with nozzle to inject a splodge of jam into each one. Best eaten while still warm. Yum! Are you a doughnut fan? They’re one of the bestest cake/pastries type things I say! I’ll have to make more won’t I! You say “easy” but I don’t think anything made with yeast is easy! Personally, I prefer cake donuts when they are really good and iced with chocolate! But raised donuts can be delish, too. And I love your “splodge” of jam! Well definitely easier than I was expecting! For some reason I thought the cooking part might all go wrong, or that it would be really hard to get the jam in, but now, it all worked well! I saw these on your FB post, and my mouth instantly watered. They look so yummy. The best doughnuts I’ve ever had were from a little kiosk alongside the Thames in London a few years back (not my recent trip but before then). Fresh, hot, sugary. Oh my. I can still remember the feel of them in my mouth. I think overall I do prefer doughnuts made over here than the ones I’ve had in the states, I wouldn’t say that about every food though! Ah well, you get your thrills in other ways! I’m salivating as I type. Don’t mind me just wipe the drool off your screen as you read this. I love donuts, but I prefer frosted to filled. But I have a mouth-watering recipe for biscuits with a jam topper in the center (rather like a thumbprint cookie if you’re familiar with them). But oh the calories and sugar in either! Yikes! Frosted, filled, frosted and filled – it’s all good to me 🙂 I wasn’t familiar with the name thumbprint cookie, but I’ve just googled it and so now I am!